The Battle of Santa Clara was a series of events in late December 1958 that led to the capture of the Cuban city of Santa Clara by revolutionaries under the command of Che Guevara. The battle was a decisive victory for the rebels fighting against the regime of General Fulgencio Batista: within 12 hours of the city's capture Batista fled Cuba and Fidel Castro's forces claimed overall victory. It features prominently on the back of the three convertible peso bill. 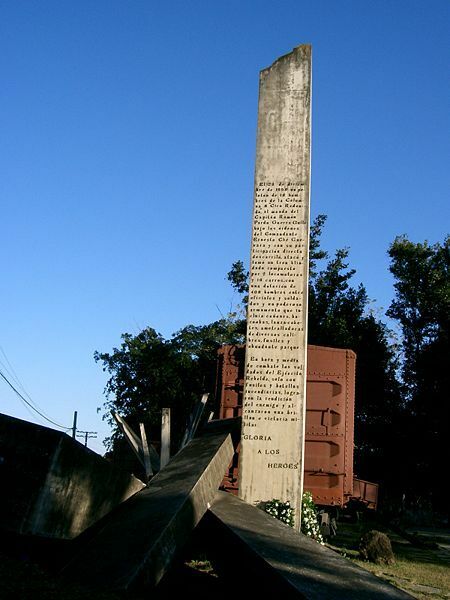 Guevara's column travelled on 28 December 1958 from the coastal port of Caibarién along the road to the town of Camajuani which lay between Caibarién and Santa Clara. Their journey was received by cheering crowds of peasants, and Caibarién's capture within a day reinforced the sense among the rebel fighters that overall victory was imminent. Government troops guarding the army garrison at Camajuani deserted their posts without incident, and Guevara's column proceeded to Santa Clara. They arrived at the city's university on the outskirts of the town at dusk. There Guevara, wearing his arm in a sling after falling off a wall during the fighting in Caibarién, divided his forces (which numbered about 300) into two. The southern column was the first to meet the defending army forces commanded by Colonel Casillas Lumpuy. An armoured train, sent by Batista to reinforce supplies of ammunition, weapons and other equipment, traveled along to the foot of the hill Capiro, at the northeast of the city, establishing there a command post. Guevara dispatched his "suicide squad", a force under 18-year old Roberto Rodríguez (known as "El Vaquerito"), to capture the hill, using hand grenades. The defenders of the hill withdrew with surprising speed and the train, containing officers and soldiers from the command post, withdrew towards the middle of the town. In the city itself a series of skirmishes were taking place between government forces and the second rebel column, led by Rolando Cubela, with the assistance of civilians providing molotov cocktails. Two army garrisons (the barracks of the Leoncio Vidal Regiment and the barracks of the 31 Regiment of the Rural Guard) were under siege from Cubela's forces despite army support from aircraft, snipers and tanks. Guevara, who viewed the capture of the train as a priority, successfully mobilized the tractors of the school of Agronomy at the university to raise the rails of the railway. The train was therefore derailed as it transported troops away from the Capiro hill. The officers within tumbled out asking for a truce. At this, ordinary soldiers, whose morale was very low, began to fraternise with the rebels, saying that they were tired of fighting against their own people. Shortly afterwards the armoured train was in the hands of the rebels and its 350 men and officers were transported as prisoners. The train contained a considerable amount of weaponry, a huge bonus to revolutionary forces, and it was to become a basis of further attack in the hands of both the rebels and supportive peasants. Various reports have suggested that the surrender of the train and the truce were pre-arranged, relying on payments made to the officers by the 26th of July Movement. Guevara himself described how the men were forced out by a volley of molotov cocktails, causing the armoured train to become a "veritable oven for the soldiers". The capture of the train, and the subsequent media broadcasts from both the government and the rebels proved to be a key tipping point in the revolution. Despite the next day's newspapers hailing Batista's "victory" at Santa Clara, contrary broadcasts from Castro's rebel forces accelerated the succession of army surrenders. The reports ended with the news that rebel leaders were heading "without let or hindrance" towards Havana to take over the Government. Most garrisons around the country quickly surrendered to the first guerrilla commander who showed up at their gate. In mid-afternoon, Che announced over his Rebelde transmitter that the last troops in Santa Clara had surrendered. Fidel Castro had ignited the Cuban Revolution in 1953 with his attack on the Moncada garrison. Five years later, his war of attrition against the government of Fulgencio Batista was beginning to show signs of wearing down the dictator. After a disastrous summer campaign, Batista was on the ropes and Castro moved in for the kill. Standing in his way was the city of Santa Clara with its large force of federal soldiers and weapons. Castro sent one of his most trusted lieutenants, Ernesto “Ché” Guevara, to capture the city. The Battle of Santa Clara would eventually become the largest and most important battle fought during the Revolution. The Cuban Revolution leadership (the Castro Brothers, Ché Guevara, Camilo Cienfuegos and others) had returned to Cuba in 1956 aboard the yacht Granma and had been hiding out in the southern Sierra Maestra Mountains, undermining the Fulgencio Batista dictatorship with hit-and-run attacks all over the country. Batista ordered a major offensive in the summer of 1958 against the rebels but it turned into a debacle that exposed the weakness of the regime. By late 1958 Batista was scared enough to call for new elections and Castro smelled blood. He sent three small armies into the interior, commanded by Jaime Vega, Camilo Cienfuegos and Ché Guevara. In December, Guevara and his force moved into position to assault the key strategic city of Santa Clara. On paper, Guevara’s attack looked suicidal. The army garrison at Santa Clara consisted of 2,500 soldiers and officers and ten tanks: another thousand soldiers were scattered at key points throughout the city. In addition, an armored locomotive containing another 400 well-armed soldiers was on its way from Havana. Ché had barely 300 men, weary from their long march and constant skirmishing with federal forces. He was outgunned, out-supplied and outnumbered ten-to-one. The numbers do not tell the whole story, however: Batista’s men were demoralized while the rebels were fired up, and the population of Santa Clara for the most part supported the insurgents. On the morning of December 28, Guevara and his men arrived and moved into position. 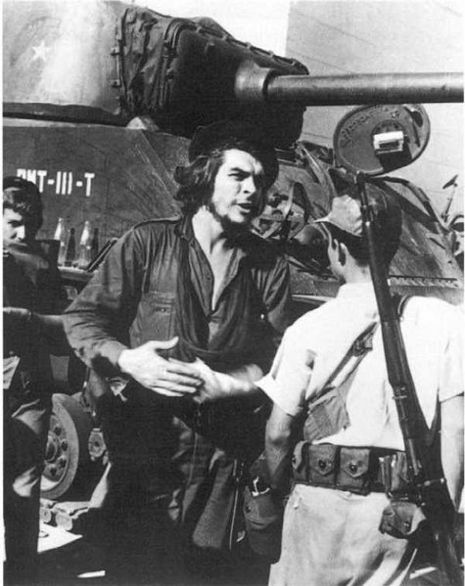 Guevara and his men were met by some of Batista’s soldiers and one of the tanks as they approached the town: some rebels were killed and others wounded. Federal airplanes strafed the rebels, who took cover in the city. The soldiers on the train took up positions on a hill outside of town and began shooting at the rebels as well. The troops in the barracks did not enter the fight, however, remaining in the military compound. Morale was very low among the soldiers, many of whom no doubt felt sympathy for the rebel cause. Guevara knew that his success would depend on three factors: keeping the large garrison bottled up, neutralizing the armored train (whose soldiers had shown the most willingness to fight) and getting the civilians of Santa Clara involved. As darkness fell, Guevara’s men moved into the city, taking up positions for the next day. The local populace helped out, creating barricades which would prevent the garrison and tanks from moving freely through the city. They also were able to destroy some rail tracks, which would come into play the next day.